Discussion in 'News and Announcements' started by Roshen, Sep 28, 2016. The EverQuest II: Kunark Ascending expansion stream will start on Wednesday, October 5, 2016 at 10AM PDT* and we would like to invite YOU to join us! This day will be full of information on the upcoming expansion. Join us for the stream, and log into Facebook to chat with us and other players! Looking for some advanced info? 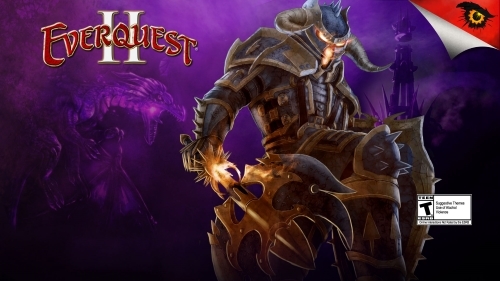 Check out the Producer’s Letter from Holly talking about what’s coming up for EverQuest II. We look forward to hanging out with you on Wednesday, October 5, and sharing the details from the upcoming expansion! Kasa, Kittybock, Neiloch and 1 other person like this. What about people who are not in Zukemberg network ? I believe you can watch it without having a facebook account unless they do something to hide it. I think the only thing you can't do is chat. Their message above implies that's the case, only mentioning logging in for the chatting angle. I was able to watch videos while not logged in. Sorry, but as I stated in Discord, I'm not a fan of how privacy breaking this is going to be. "Log in and chat with other players"? If I wanted other players to know who I was on FB, I'd post it in my sig. You may think this is a good idea, but what's going to happen is someone is gonna upset someone else with a comment, and then it's gonna lead to being spammed and threatening/hateful messages, etc. I just don't think this is going to end well. santargria, Belenos, Zhaanish and 2 others like this. Belenos, Zhaanish and Raff like this. I get FBL is becoming a bigger and bigger thing now but why FBL over Twitch? Zhaanish, Finora and Prissetta like this. Ok well I'm excited! And it's 6 pm in the evening for me so even better having finished work for the day wheee! It would be great if someone could post the highlights for those of us that don't use FB. Belenos, Smallcorners and chattie like this. All I care about is beta testing gear this time. Everything else is secondary. I'm not going to buy the expansion in order to beta test for you this time. ToT was a lesson learned. It was by far the worst reward system and itemization since EQ2 launched 12 years ago. We want rewards worthy of our efforts. Kuulei, Mizgamer62 and Crastinal like this. I've tried to watch Facebook live stream videos in the past and it was not a good experience - lots of buffering and black screens. Sure hope this one goes better. Zhaanish, Ceyllynn and Xianthia like this. I think I will just wait for the Feldon recap. Don't care for Facebook (or Twitter), don't have an account there, don't want an account there (even using a pseudonym). And yes, I want to know why they aren't using Twitch again. It worked, apparently it worked well, so why change now? Never Facebook! Never Twitter! I am a very private and boring person, and I see no need to snoop on other peoples lives, even if they (foolishly?) offer it. santargria, Belenos, Xillean and 7 others like this. My first reaction was "what happened to Twitch?" I hear you, it's not like Facebook thwarts accounts with pseudonyms by violating their ToS or anything... Oh, wait. Zhaanish, Ceyllynn, chattie and 3 others like this. I would assume you can put this link into an "incognito" or similar page that doesn't auto log into facebook and watch the livestream that way. I always use incognito ever since the kids shows I set up for my foster kids to watch on youtube ended up on my facebook feed. Hey everyone, Elinea is watching Thomas the Tank Engine! Kittybock, Sejreia, Ceyllynn and 1 other person like this. I see what's happening. Blame it on the kids, eh? You are such a Thomas the Tank Engine lover! Kittybock, Sejreia and Ceyllynn like this. “The EverQuest II: Kunark Ascending expansion stream will start on Wednesday, October 5, 2016 at 10AM PDT* and we would like to invite YOU to join us! I believe its advertising/marketing. Just more exposure doing it on facebook rather than twitch. While I don't have a problem with it myself I can definitely see how people wouldn't want to participate using their real name/profile and asking people to make throw away accounts just for this is a little much. It really should be simulcasted on twitch as well and have it so both chat streams are being watched for questions. Its possible to make alternate/fake facebook accounts but they are outright against their ToS. People are only allowed to have 1 account unless a second account is for a business (iirc). This is for all those people who say they never advertise EQ2. Well they are doing it now, advertising on facebook and social media in general is EXTREMELY effective for the money you put into it. When i switched from adwords to facebook advertising for my small business it was insane how much better it was. You just don't get to pick your mediums AND advertise efficiently, no matter how much you spend. Even if this was on twitch they should have a method to submit questions before the broadcast for them to pick and choose from. At least that way there is a chance a non-facebook user will get their specific question answered.